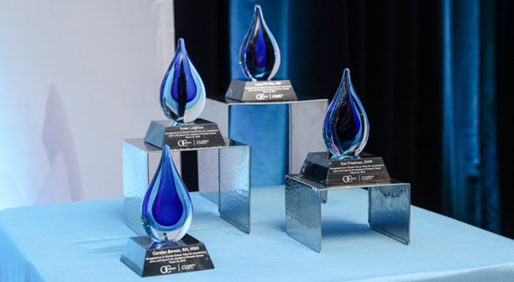 At the inaugural Ovarian Cancer Heroes gala, held in New Orleans ahead of the 49th Society of Gynecologic Oncology Annual Meeting on Women’s Cancers, four individuals — a physician, nurse navigator and two patient-turned-advocates — were awarded for the contributions they have made to increase awareness and advance research and education for ovarian cancer. Driving research and awareness by working together are ways in which the word cure might one day be heard in the ovarian cancer community. Members of the tight knit “teal army” gathered last night for the inaugural Ovarian Cancer Heroes gala. Actor, cancer advocate and Breakaway from Cancer® Ambassador Patrick Dempsey was the keynote speaker whose message of collaboration, compassion and empathy captivated the audience of more than 150 gynecologic oncologists, nurses, advocates, patients and loved ones. “It is such a tremendous honor to be in this room with real doctors,” joked Dempsey, who starred on the hit show Grey’s Anatomy playing neurosurgeon Derek Shepherd. His mother’s diagnosis was the main reason he and his sisters founded the Dempsey Center in Lewiston, Maine — Dempsey’s birthplace — in 2008. The center provides free cancer support, education and integrative medicine services to people affected by the disease with more two dozen programs at their fingertips, such as support groups, grief programs, stress management, gentle yoga, knitting and nutrition education classes. At the gala, held in New Orleans ahead of the 49th Society of Gynecologic Oncology (SGO) Annual Meeting on Women’s Cancers, four individuals — a physician, nurse navigator and two patient-turned-advocates — were awarded for the contributions they have made to increase awareness and advance research and education for ovarian cancer. The first Hero honored has been in oncology nursing for more than 30 years. Carolyn Berson, RN, MSN, serves as a liaison between the health care team and patient from the time of diagnosis through continuum of care. For the last 11 years, she has worked as a nurse navigator for the Gynecologic Oncology program at John Muir Health in Walnut Creek, California, providing guidance to patients and their families, especially in areas of symptom management and quality of life. Berson’s patient, Tamar Vered, nominated her for the honor and stood next to her as she was presented with the award. Vered stated that Berson filled an “invaluable role” as she feared her life was over at 48 years old following her ovarian cancer diagnosis. “If it weren’t for Carolyn, I wouldn’t be where I am today, with a positive outlook, well-educated regarding the disease and with an organized approach to tackle and continue to fight what has been the toughest time of my life,” said Vered. Sue Friedman, DVM, was diagnosed with breast cancer more than 20 years ago. Upon learning she carried the BRCA2 mutation, she realized not enough information about hereditary breast and ovarian cancer existed. She gave up her veterinary career, and, from her living room, she created Facing Our Risk of Cancer Empowered (FORCE), for which she currently serves as executive director. The national nonprofit organization offers many free services including a peer navigation program, research recruitment for clinical trials and a program, XRAYS, that translates media reports on emerging research into language that patients and caregivers can easily understand. Like Friedman, Susan Leighton also saw firsthand the limited amount of resources and research being done to improve survival for patients fighting ovarian cancer. Diagnosed with stage 3C disease in 1997, she set the wheels in motion as she recovered from treatment. In 2004, Leighton co-founded Lilies of the Valley, a nonprofit organization that supports women with gynecologic cancers in the Tennessee Valley. Since its inception, thousands of women have been provided awareness materials. Then, Leighton set her sights even higher. She took her efforts to Capitol Hill to push for funding. She also joined forces with the Ovarian Cancer Research Fund Alliance for which she serves as the national program director of its Survivors Teaching Students program. Under her guidance, 850 volunteers educated more than 11,000 medical and nursing students nationwide about ovarian cancer in 2017. Laurel Rice, M.D., chair of the Department of Obstetrics and Gynecology and a professor in the Division of Gynecologic Oncology at the University of Wisconsin-Madison School of Medicine and Public Health, also serves as president of SGO. Since taking on the role, she has worked to increase the number of cutting-edge clinical trials available for women’s cancers through a multi-pronged approach. Rice created a Clinical Trials Task Force to develop a mentoring platform for junior investigators, a campaign to support federal funding of clinical trials, a grassroots campaign to raise public awareness of trials and a public/private partnership to improve the availability of trials. In addition, she has been instrumental in trying to launch a patient-friendly online search platform and patient navigation service to increase enrollment in clinical trials. The Ovarian Cancer Heroes event was hosted by CURE Media Group and sponsored by Tesaro, developer of two oncology agents — Zejula (niraparib), an oral PARP inhibitor, which is approved for the maintenance treatment of adult patients with recurrent epithelial ovarian, fallopian tube or primary peritoneal cancer who are in a complete or partial response to platinum-based chemotherapy, and Varubi (rolapitant), an injectable agent approved to help prevent delayed nausea and vomiting associated with chemotherapy.